There is nothing I love more than a trip to the theatre, and yet living in the North we are far more limited to a choice of shows than in London and the West End. I’ve been lucky enough to see several shows in London over the years, from Phantom of the Opera to Wicked, twice over, and no matter how many times I go to the theatre, the novelty never wears thin. Nothing gives me goosebumps quite like that opening line, or brings me to tears like that final standing ovation, and I just love that feeling or being lost in the music. For me, there is no better gift than the gift of time – be that spending time together with a loved one, experiencing new for the first time, or just enjoying a break from the kids doing something I wouldn’t ordinarily do. Thanks to Red Letter Days there are a whole host of experiences you can gift and of course, theatre trips for someone special. With a variety of packages to suit all budgets, Red Letter Days do hotel and show packages for two, staying in the centre of London, from just £219. For me the package of choice would be the Stalls or Dress Circle Theatre Show and 4 star Friday night London hotel break for two, priced at £325. The package includes a top city hotel, located within zones one to three, in a twin or double room, with excellent facilities and breakfast included. On the evening of the stay, head to London’s bustling Theatreland to collect two top price tickets to a West End show from a choice of Motown, Wicked, Young Frankenstein and The Woman in Black. This glitzy short break and theatre treat (options include The Ambassadors Bloomsbury, Kensington Close and Spa and Corus Hyde Park) is the perfect way to experience London and all of the fun and excitement it has to offer. We are offering one lucky reader the chance to win the hotel and theatre trip for two priced at £325 simply by entering via the link below. One winner will be chosen at random and notified via email at close of giveaway on 21st April. Voucher is valid for 12 months from date received. Good luck! Such a wide choice but I think I’d plump for Motown. It would have to be Wicked. I would really like to see Wicked, Waitress, Les Miserables and just the list them all here! Seeing London and any show would be a bonus! I would love to see The Lion King. I would choose Aladdin. My daughter and me love the theatre and I know she would love this show . I’ve heard so much about Lion King being truly amazing, so that would be my choice to take the children to. For me the clear winner would be Motown. I would like to Defy Gravity, and swoop in on my broomstick to see Wicked! We really wanna see Young Frankenstein ! I would love to see the lion King or the woman in black! Amazing prize, would love to see Wicked! We’d love to see Phantom of the Opera. I’ve always wanted to see Wicked! For me it would have to be Wicked as I have never been to the Theatre before and have heard so many good things about Wicked. I would love to see the musical Wicked. I’d choose to see Wicked! I would like to see Motown. I would love to see the Lion King! It’s my mum and dads 25th wedding anniversary at the end of April. I’d gift them this prize. I think mum would like les miserable or wicked if possible. Dad would like whatever made mum happy! I’d like to see the “Twlight Zone”. I would love to go see Wicked as I have never seen it! I would love to see Wicked! I’d be happy to see Phantom, Les Mis, Wicked, Dirty Dancing, Hamilton….so many to choose from!!! I’d pick the Young Frankenstein musical. 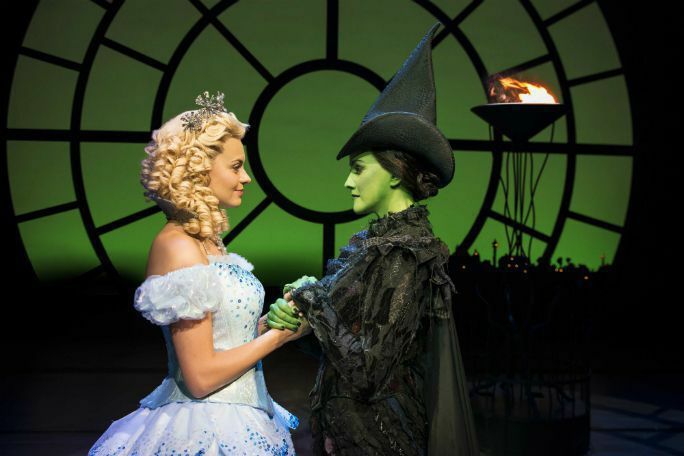 My daughter is desperate to see Wicked – she won’t let it go that I saw it without her. I’d love to see The Woman In Black! Would love to see Motown for the first time or Wicked again because it was so good! Would love any show but if I had to choose it would be Wicked. maybe the woman in black…? ooh so much to choose from! I think I’d have to go eeny, meeny, miney mo! The Lion King is on my bucket list! I’d take my boyfriend to see Wicked as we both really want to see that! Would love to see Wicked. I’d take my husband to Les Mis as he’s always wanted to see that! Phantom of the opera and i’d take my daughter. The Lion King would be my choice. I would like to go and see Wicked. I think I’d have to choose Wicked! I’ve always wanted to see it. The Woman In Black. I saw it about 28 years ago, would love to see it as an adult! Despite having already seen it once, I would choose to see Wicked again as it was so brilliant. I would probably chose Wicked. Out of the shows on offer, I would choose Mowtown. The Lion king would be awesome!! Motown, definitely – I’ve been wanting to see it for ages! This would be a super treat!! Only fools and horses sounds like a real good fun one to see. I’d LOVE to see Only Fools and Horses, please. I’d love to see the long running musical – The Lion King. We have always wanted to see The Lion King!! Always wanted to see a West End show, never had the opportunity to do it. I would love to see Wicked! I’ve heard so much about it and its on the top of my bucket list! I would love to win!! I’d love to see School of Rock, but to be honest any musical would suit us. I’d like to see Hamilton. Brilliant! I would choose to watch Motown. Definitely Wicked as I haven’t seen yet!! I’d love to take my hubby to see Motown! Wicked because we’ve not seen it….or we will rock you because we love it! Joseph and the Amazing Technicolor Dreamcoat. I saw it when Jason Donovan was in it originally. The Woman in Black definitely! I’d love to take our daughter to see Mary Poppins. Having just been to Harry Potter Studio Tour with my daughter, it would be perfect to see Harry Potter and The Cursed Child. I’d love to take my Mum to see Mama Mia! I have very strong memories of my Mum playing ABBA when I was growing up in the 70’s! id love to take my family to see The Lion King!! My partner and I have always wanted to see Wicked. We would really really love to see Thriller. We went to see Wicked last year – it was amazing! I can’t wait until my daughter is older so I can take her! I would choose to watch The Woman in Black. The Tina Turner musical. I’ve heard great things about it. I would love to see Motown or the Lion King. I think I would love to see The Lion King Again. I’d love to see The Lion King. I would love to see Wicked, not seen it before but heard so much about it, looks amazing! OMG there are so many I would love to see. Wicked and the Lion King are at bucket list level – but I would love to see Tina and 9 to 5 as I have seen both TIna Turner and Dolly Parton live – so I am a huge fan of both. But then I might just want to sing along to Mamma Mia. How would I decide?! Would love to see Les Mis! I’d love to see Les Miserable or Wicked. But my boyfriend has never been to a west end show before, so I might let him choose. From that list, I would choose Motown as I have seen the others. Definitely Wicked, it is the one that is the top of my wish list! I would choose Motown. It looks so amazing. Would love to see Les Miserables. Wicked! Not seen it yet! Phantom of the Opera would be excellent! Would love to see Woman in Black. The Woman in Black. Would love to see it! My Daughter is desperate to see Wicked, so would have to choose that one! I think I’d choose The Woman in Black. I would love to take my daughter to see Wicked. Matilda, my son really wants to see it. Mt top show to watch would be Hamilton, followed by Les Miserables, but hard to get tickets for these! I would choose The Woman in Black. The original film is one of my favourite and I’d love to see how the show compares. Wicked as it is my favourite! I’d go for Wicked or The Lion King as they are amazing, although I do want to see the Book fo Mormon so maybe that. I’d choose the Book of Mormon. I love that show! I’m not sure – there are so many to choose from. I’d like to see Young Frankenstein – hope it’s as funny as the film! I would like to see Wicked or the Harry Potter one. I’ve still not seen Wicked. I really must before it’s too late. I’d choose Wicked if I won. Tough choice but Phantom Of The Opera wins. Wicked and The Woman In Black have been on my ‘must see’ list for some time, so I’d choose one of them to enjoy or scare the living lights out of me..! I’d love to see wicked again!! The Wizard of Oz is my favourite movie ever so it would have to be Wicked for me! I’d like to see Cats when Jennifer Hudson is in it…. I think I would choose Wicked, but would need to let my daughter choose !! I would love to see Motown as I have not seen this yet! Motown, Wicked or The Woman In Black in that order. This sounds such a wonderful treat, I would love to see Motown, and I know that my usband would love that too. Wicked sounds amazing! l would love to go and see that with my hubby! Got to be Wicked, my parents saw it recently, they loved it! Would love to see Wicked! It’s on my birthday!